During the Mushroom Days 2016, 87 exhibitors presented their products and / or services to the visitors. 26 of the exhibitors were international exhibitors. A record number of 2839 visitors from 78 countries visited this edition of the Mushroom Days. 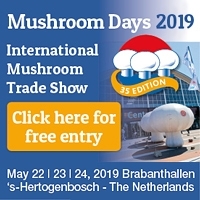 On May 22-24 2019, the next edition of the Mushroom Days will take place. Being a platform to meet all relevant mushroom growers and related players in the industry, the Mushroom Days are an indispensable part of your marketing and sales strategy. Femke Willems or Anoeska Hagenstein.